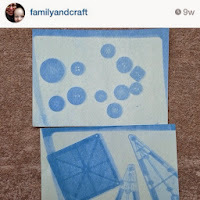 A while back, I saw some sun prints on familyandcrafts Instagram feed, Leah had used solar print paper. I didn't want to buy any specific paper, but got me thinking about how when we were at school (a loooong time ago) when the teachers took down the wall displays, the paper behind was always faded! I'm sure we used to call that particular paper 'sugar paper' but it would appear it's now called craft paper, I knew I had a pack so T and I got started! 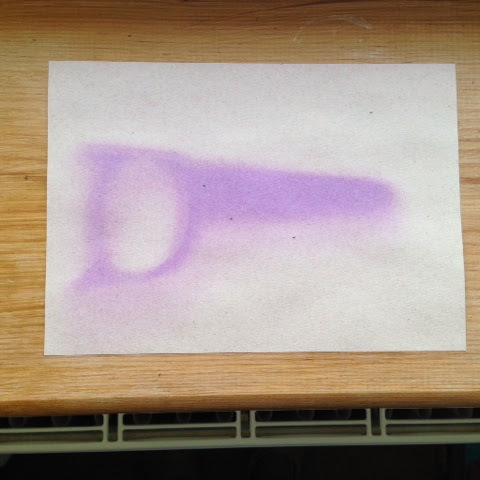 I've just gone back to the post and people subsequently mentioned that you can also use 'construction paper' to do this - not sure if this is the same as craft paper in the UK but thought it was worth mentioning! I did this a couple of weeks ago when we were having storms and rain was predictable, so we set it up in a very sunny windowsill, I'm sure the process will be quicker if outdoors in full sunlight. I started by sorting out a few item which would still be distinctive once the paper was sunbleached:- a toy saw, a spoon, a toy banana, some coins and a baby coat hanger. It was my intention to use all the items and do multiple 'photos' but T just wanted to do one of his saw - the joys of giving toddlers choices eh?!? 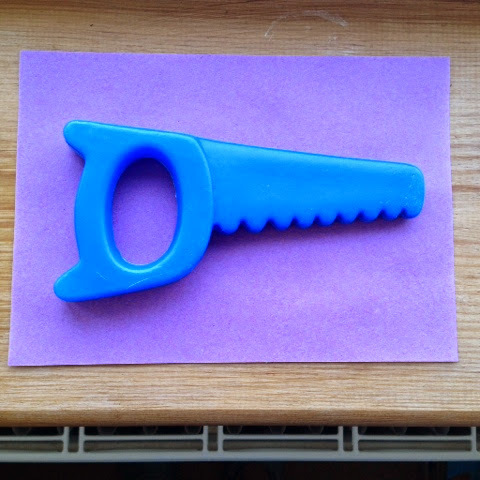 We placed the saw on the paper and left it. After 3 days, this had happened!!! 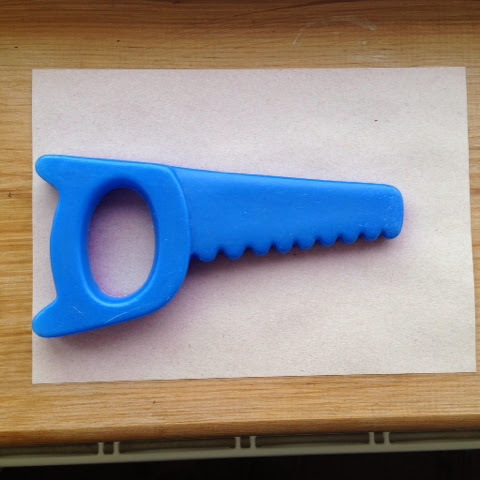 The paper had dramatically changed colour and had left a print of the saw!! 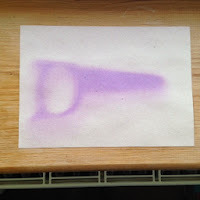 There was also a slight shadowy outline, I'm guessing this was caused as the sun moves and caused shadows. As you can see, our images were not nearly as defined as Leah and her babies created, but I'm happy with the results more for a science project than anything. T and I checked on the progress everyday and it was good for his short attention span to have to wait a while for the results. I guess results would vary depending on the amount and intensity of sun and if done indoors could easily be a year round activity. We also talked about how hot the sun is to have faded the paper. I'm so pleased we tried what we had on hand rather than buying the special paper. 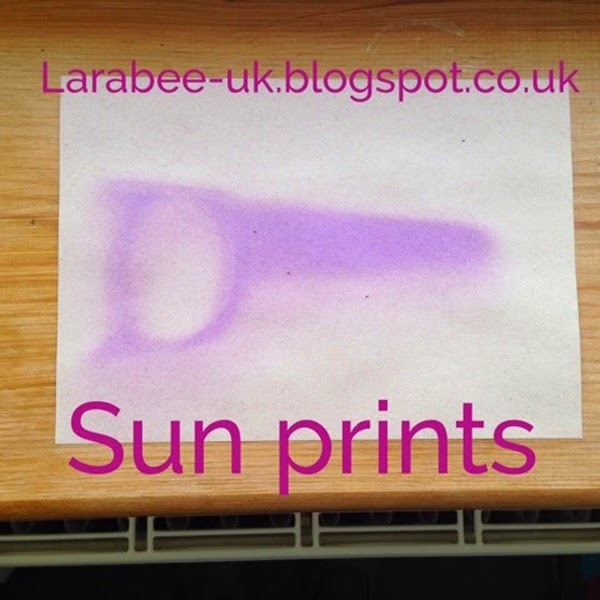 When T's at school, I'd like to try this again but in a more 'scientific' way, placing objects on different windowsills, recording the results and analysing how the solar patterns affect the results. This post is linked to Link & Learn at no time for flash cards. We can use construction paper to do an activity like this. Thank you for sharing. Hello from Link & Learn. I love the Link & Learn linky - it's my favourite.